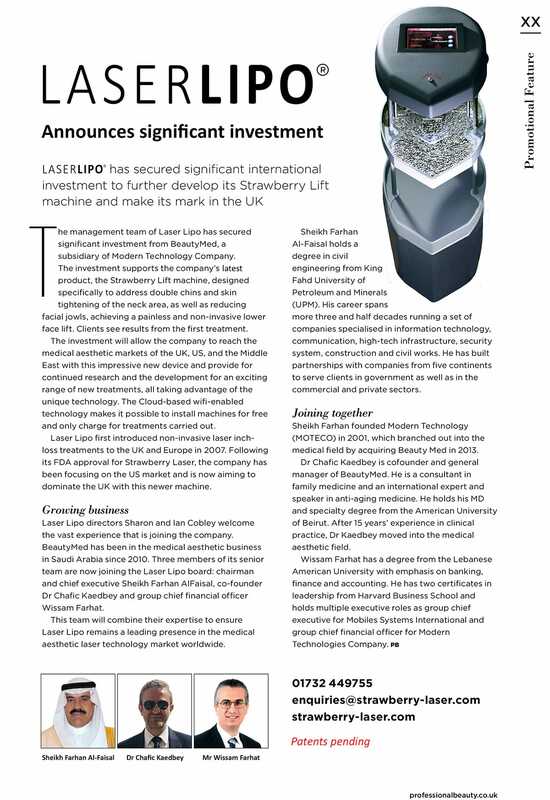 Leaders in Aesthetic technology Laser Lipo LTD have announced significant investment to further develop their ground-breaking Strawberry Lift machine – the world’s first laser for the reduction of double chins, neck and facial jowls. After first introducing their non-invasive laser inch loss treatments back in 2007, Laser Lipo LTD launched Strawberry Lift. With its FDA approval, the company has been focusing on expanding to the U.S market and dominating UK medical aesthetics with the machine. The investment comes from BeautyMed, who have been in the medical aesthetic business in Saudi Arabia since 2010. Chairman and Chief Executive Sheikh Farhan Al-Faisal along with co-founder Dr Chafic Kaedbey and chief financial officer Wissam Farhat will combine their expertise to ensure Strawberry Lift continues to make an impact in the UK aesthetic market. With this investment, Strawberry Lift will also reach the medical aesthetic markets of the U.S and Middle East. Hello, is the machine and training available for therapist in UK at all? What is the price of the machine please? Hi, thank you for your interest, please contact us on enquiries@strawberry-laser.com for all the information.